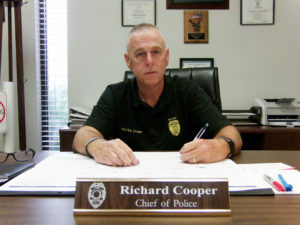 Sitting behind his desk at the Selma Police Department, Police Chief Richard A. Cooper looks at a calendar and counts down the number of days left before his departure. Chief Cooper recently informed his department he would be retiring effective Friday, August 31st, two days after his 56th birthday. Born in Portsmouth, Virginia, Cooper moved to Selma at the age of 10. At the age of 14 he was working every day after school in a local grocery store. He graduated from Smithfield Selma High School in 1981 and began working full-time in the grocery store industry making his way up to a Food Lion store manager. It was a great job, but he wanted to give back and do more for his community. In 1995, Cooper took a $23,000 per year pay cut and joined the Selma Police Department. He began as a patrol officer and was later promoted to sergeant, K-9 handler, and worked in narcotics. Twice he was named the Selma Police Officer of the Year. He was a Captain in December 2013 when former Chief Charles Bowen retired. Selma town leaders selected Cooper as the new chief. Since then the police department has made numerous changes, all designed to better serve the citizens of Selma. Under his leadership, the Selma Police Department has become a more professional pro-active department with high morale and a very low turnover rate. The department made their first uniform change in more than 25 years, and nearly half the force, including Cooper, holds advanced law enforcement certifications. Many officers have college degrees. By the end of September, Selma Police will be the only law enforcement agency in Johnston County where 100 percent of its sworn officers have completed and been certified in Crisis Intervention Training (CIT). Cooper was the first police chief in the county to undergo the training. Cooper applied for and received a grant to purchase new computers and update their training room with state of the art equipment. With a recently approved police K-9, the department has a K-9 on all four patrol shifts, meaning a K-9 officer will be on patrol in Selma 24 hours a day, 7 days a week. And that K-9 can also assist other agencies in Johnston County if needed. Chief Cooper said he is very proud of his entire department. When he leaves on August 31st, he wants to be remembered for making a difference. “I hope and feel like I did make a difference. I am going to miss the people I work with and the citizens I see and talk with on a regular basis,” he said. “I have always been dedicated to home and work.”That dedication shows. He has never worked for another law enforcement agency since being hired by Selma Police in 1995. After Aug. 31st, Chief Cooper doesn’t plan to slow down anytime soon. He plans to look for a full-time job in the grocery store industry. His goal is to work to age 62 and then maybe, just maybe, work part-time. Richard Cooper is married to his wife, Tammy Cooper, a retired Johnston County Public Schools teacher. They have two sons, Chase, 26, a deputy with the Johnston County Sheriff’s Office, and Christian, 16, a rising Junior at Princeton High School. Cooper and his wife recently purchased a place at the beach and hope to spend their free time enjoying the coast. The Selma Town Council will honor Chief Cooper at their August 14th monthly meeting.